I recently had a conversation with…someone (I can’t recall who) about how Cinco de Mayo isn’t heavily celebrated in much of Mexico. I say, you never need a reason to enjoy a celebration and Mexican food – it’s always perfect. Always. Please recall how I could eat Mexican all day every day, especially when I am actually in Mexico. Sigh…I want to go to Mexico. 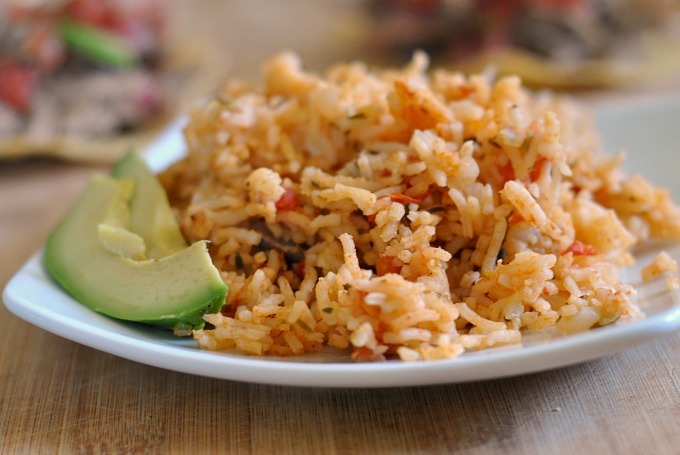 Mexican food that involves refried beans and rice is a complete Mexican meal. And please don’t make me choose between rice and beans because when both are GOOD, there’s just no way to choose one over the other. 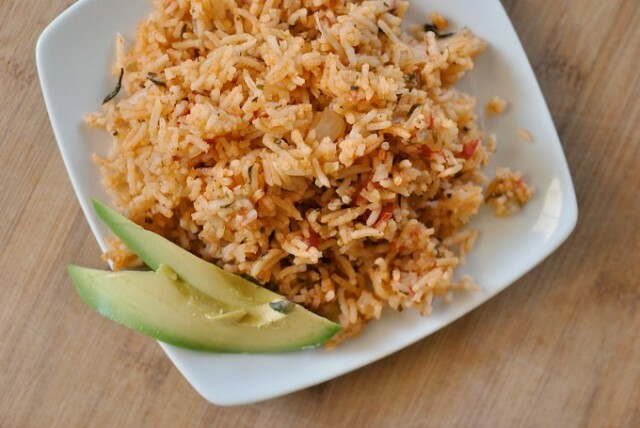 Admittedly, though, I’ve never made a Mexican rice recipe that I love…until this one. 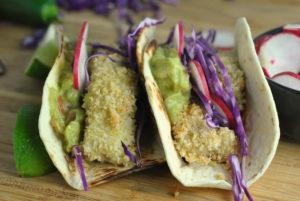 Easy to make and packed with fresh ingredients and flavor, I hope this recipe will perfectly accompany your Mexican delight this Cinco de Mayo and always – tacos, burritos, fajitas, enchiladas, you name it. Enjoy! Heat olive oil in a large sauce pan over medium heat. One hot, add the onion and cookfor 6-7 minutes or until softened. Add garlic, stir, and cook until fragrant, about 30 seconds. Stir in rice and cook until just starting to brown, about 3 minutes. Add broth, tomato sauce, and tomatoes; bring to a boil. Add remaining ingredients (cilantro, oregano, and salt), stir, cover, and reduce heat to low. Cook rice for 15 minutes; turn off heat and allow to sit (covered) for about 10 minutes. Fluff with a fork and serve. 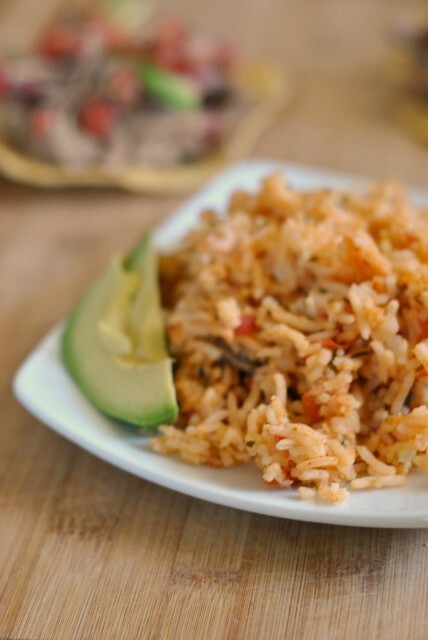 I’ll have to give your Mexican rice recipe a try, because like you, I have yet to find one that I like! Have a great day Nicole! I am from Mexico but my husband is Canadian. We live in Vancouver B.C. You didn´t talk to me (lol), but that is right. In Mexico we don´t celebrate as much 5 de Mayo. It is also funny, “burritos” are not really from Mexico. The first time I saw them in Mexico was in “7 Eleven”. (lol). Believe it or not I have never done rice from scratch, I am not very food at cooking rice, it never comes out good! (lol). 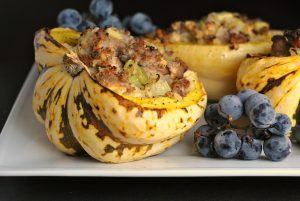 I actually will try this recipe which looks very good. Tomato is one of the basic ingredients for the Mexican cuisine, so does chipotle. Nicole, this looks like a really tasty recipe. I guess that it’s not that spicy, considering it’s Mexican rice? Tried this recipe and it turned out really well! If you think Mexican food is just burritos and fajitas then think again. Do you have any more Mexican recipes? I was actually thinking the other day I should give Mexican food another try, because a lot of people have been asking me to post healthy Mexican recipes on my blog, but since I have a sensitive stomach, I never really liked it. This recipe sounds nice and light though, and I am in need of some variation in my meals, so I’ll definitely try it. Thanks!